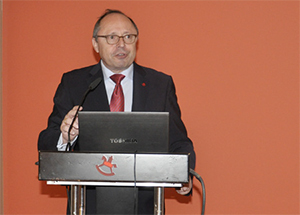 Cognitive development naturally changes and becomes more complex as children grow. During the first years of a child’s life, he will grow trillions of brain-cell connections, called neural synapses. Providing children with opportunities to explore and interact with the world around them through toys and play will encourage those brain-cells to connect and “wire” their brains as they grow into adulthood. The importance of play Children have many opportunities for cognitive growth beginning at birth. Interactions and experiences in their environment will support their brain development and promote cognitive skill development during childhood and forming into adulthood. “Play allows children to use their creativity while developing their imagination, dexterity, and physical, cognitive and emotional strength,” as stated by experts. This is Part Four of a series of posts that will concentrate on the inherent benefits of play for children with special needs. 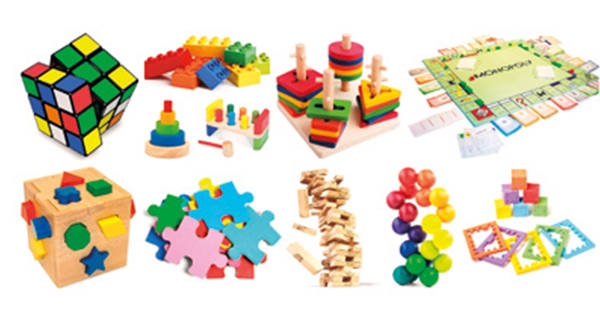 In this post we focus on how toys and the experience of play help with cognitive development. 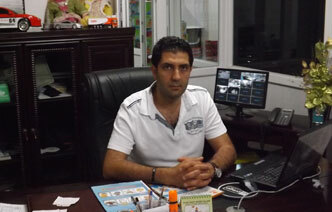 Part One was devoted to toys and the development of gross motor skills. Part Two of the series was associated with physical development and the growth of fine motor skills Part Three of the series was related to emotional development. For the average person the concept of play is considered helpful in assisting a child to grow, learn, develop and thrive. What many don’t realize is that play is extremely helpful when it comes to physical, social, emotional and cognitive development. Just as a child develops gross and fine motor skills, social and emotional skills, cognitive skills are practiced and promoted starting at infancy. Through play, children are gaining confidence, learning decision making skills and acquiring critical thinking skills that will prepare them for adulthood. Children are naturally curious and constantly learning about the world around them. New noises, sounds and objects for them to discover. Cognitive development is the ability to process information, reason, remember and express emotions which can be promoted through many facets of play- dress up, board games and active play for example. As children grow and learn new cognitive skills, they are able to integrate the new with the old, building their knowledge and understanding. The etymology of cognition means “to know” in Latin. Maybe that is why kids ask so many questions, so they “know” everything? Below are toy suggestions that can assist children in developing critical cognitive milestones and hopefully help them answer some of their many questions. 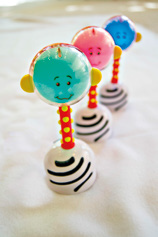 NogginStik is a toy that focuses on skills children need in the first developmental stages of their life. This rattle-like product encourages many other developmental milestones such as: auditory attention, sensory stimulation and grasping. When the NogginStik is tapped or shaken, a soft glow light changes colors between red, green and blue! Children can practice their eye tracking with the lights- creating those neuropathways that help develop the skills for reading. 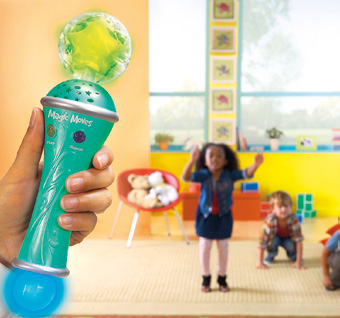 The Magic Moves wand provides 90 fun commands, 26 musical tunes and incorporates light shows that flash to the beat of the music. The Magic Moves wand also surprises you with actions like, “Freeze,” “March,” and “Let’s Dance” in between actions. 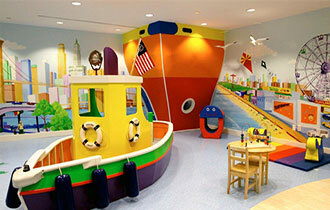 Fundamental learning is provided through auditory, visual and kinesthetic stimulation during play. Kids can use their imaginary play skills to play gas station, café, gym and more! 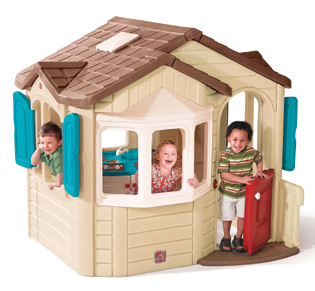 The playhouse is big enough for lots of kids to play and explore. These activity cards promote cognitive skills, motor skills, language skills, self-esteem and sensory awareness using simple, everyday items found in the home. The cards are sturdy and laminated and include helpful illustrations and simple instructions for each activity. 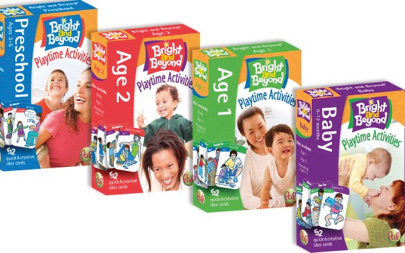 The Bright & Beyond Activity Cards provide fun, interactive experiences for kids! 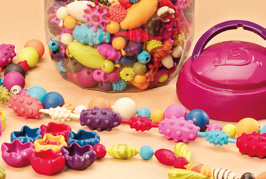 Pop Arty comes with 500 beads that snap-together in different colors, shapes, sizes and textures to make bracelets, necklaces, rings and more for creative play. Have children create reoccurring patterns with the beads to begin to learn about order, sequence and prediction. This toy provides kids with endless play to explore and create! 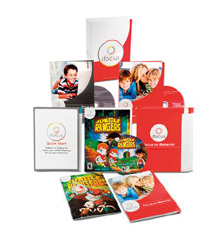 ifocus Jungle Rangers is a computer software game designed to improve a child’s focus and attention through memory and recall, sequencing and more. Jungle Rangers provides children with interactive characters that teach them the skills needed to play each section of the game. The games are intuitive- the child does not select his own level; the game identifies the player’s ability and advances when he is ready. The games are engaging to children who already enjoy video games, but also inviting to those children who do not typically play them! As the game states, “Easy To Play, But Hard To Solve.®” Children need to manipulate the squares to make nine completed matching designs. 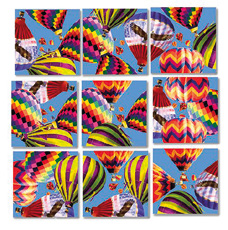 Scramble Squares is a great game to build up to by starting with less pieces or even creating new games like memory to play! 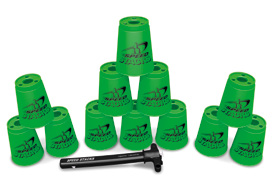 Speed Stacks are great for playing independently, on a team or challenging a peer. Speed Stacks challenge a child’s motor skills and cognitive skills at the same time by using speed and memory to stack and unstack as fast as possible!